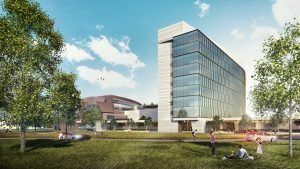 In a forward-thinking response to rapid changes in improving patient care, streamlining staff efficiencies and enhancing community partnerships, The MetroHealth System unveiled plans for a new 11-story Acute Care Hospital on its 52-acre Cleveland campus. Designed by HGA, the hospital includes private patient rooms featuring floor-to-ceiling windows, accommodations for overnight family visits and the flexibility to incorporate ICU capabilities. The facility’s master plan reveals a “hospital in a park,” in which 25 acres of former surface parking in the northeast corner of the campus will be transformed into bucolic park-like space connecting patients, visitors and staff to the emotional and physical benefits of nature. MetroHealth’s in-house Lean team continuously researches new operational processes and delivery methods to address patients’ diverse needs. With HGA, they formed a research-focused I-Team to identify and address best practices to fulfill the health system’s promise to patients: to design a cost-effective, sustainable and patient-focused hospital. Through intensive predesign workshops, the team examined innovations in space utilization in order to quickly adapt rooms to new delivery methods and processes—essentially developing a highly flexible, neutral platform—to better serve patients. The result was a Process Neutral Design approach for the new hospital by introducing a neutral care platform that integrates current and unforeseen processes 50 years into the future. The Process Neutral approach stresses design that utilizes assembled rather than constructed parts—including modular and open plans, prefabricated components, movable walls and demountable systems—to establish a flexible, neutral platform in which rooms and spaces can quickly be reconfigured depending on patient needs, advances in care and changing programs. 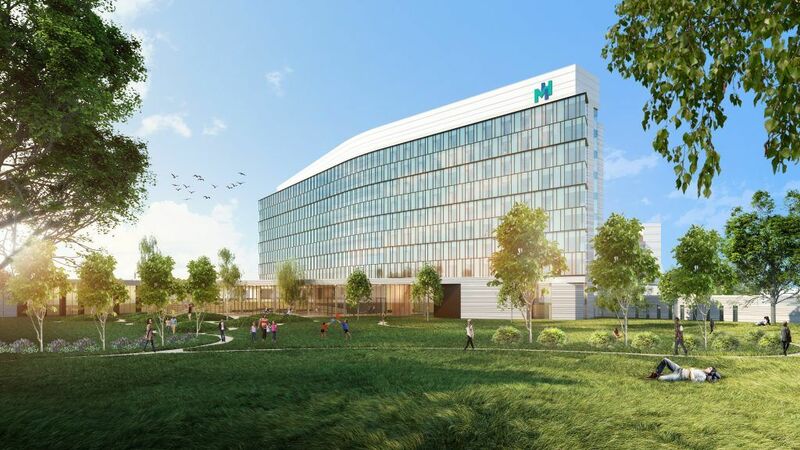 MetroHealth’s new Acute Care Hospital is an essential component of its transformational master plan, which emphasizes research-based care within a landscaped urban setting. The hospital will be connected to the existing Critical Care Pavilion (CCP) via an enclosed overhead walkway. Entering the building from a west-facing entrance off Scranton Road, visitors will experience a two-level front lobby with a gift shop, dining area, and open space for community performances from local choirs to ballet companies. An “on stage/off stage” concept will be used for traffic flow, with staff and patients and family members using separate elevators. Founded in 1837, MetroHealth System is an integrated health system with an acute care hospital housing a Level I Adult Trauma and Burn Center, a skilled nursing facility, and more than 25 locations throughout Cuyahoga County, Ohio. MetroHealth handles more than one million patient visits annually, including more than 100,000 in the Emergency Department, averaging 274 Emergency Department visits daily.